The cycling lifestyle is so embedded in the Netherlands, that its status quo to take your bike – and yet remains the cooler option. 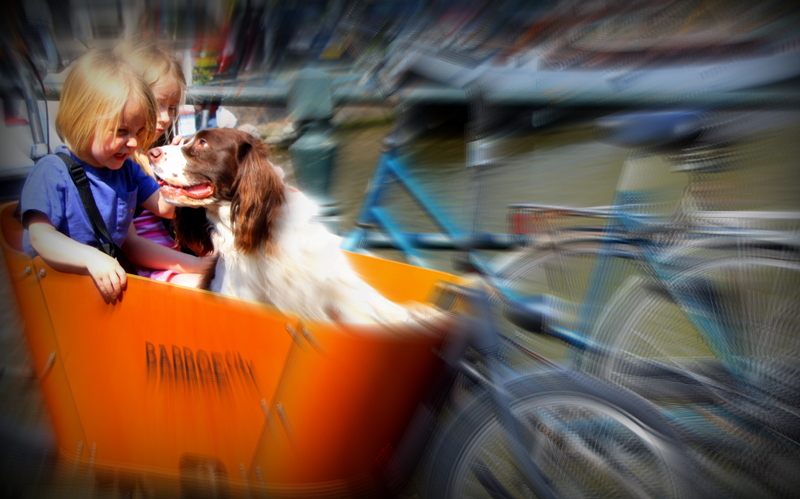 The Dutch are almost born on the bicycle. 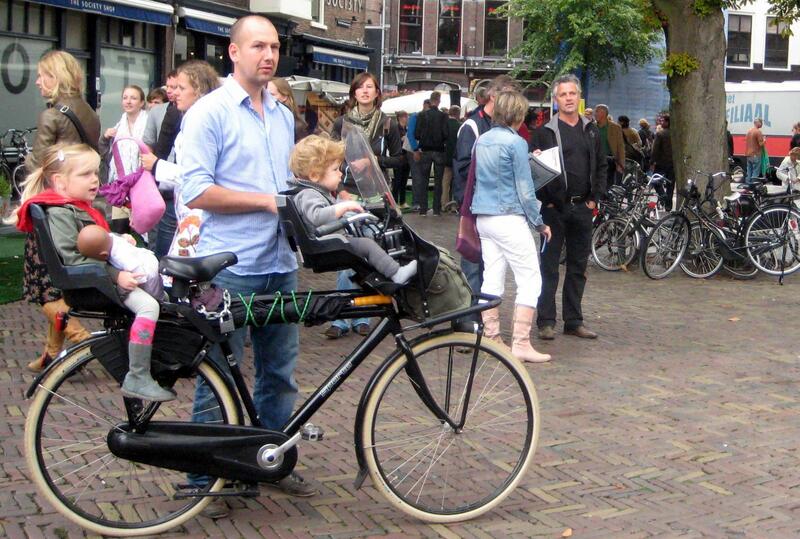 Parents willingly strap infants into miniature bike-seats on their handlebars, with toddlers in a second seat behind them. 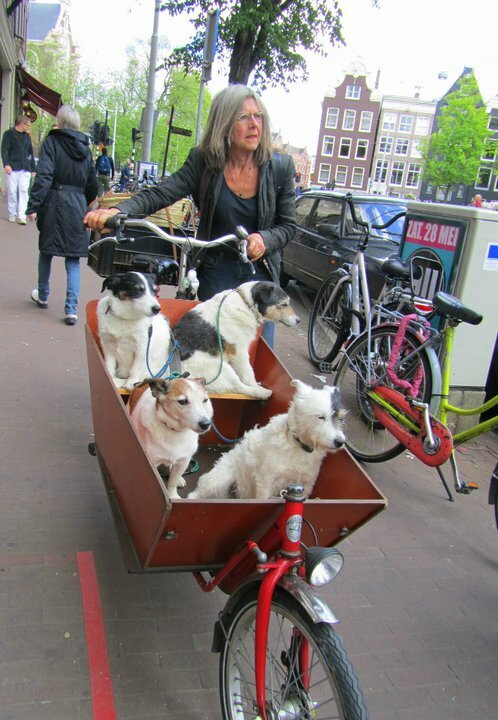 I’ve seen mothers (or fathers) with up to three children on a bicycle – or one child, one dog and the second child on his/her own mini-cycle. In Amsterdam, the sheer volume (and variety) of bicycles is astounding. Bicycles come in all shapes & styles – old barely functional versions and shiny new renditions. They are identified by plastic flowers adorned to their handlebars, spray-paint, or large brightly coloured bells. An equally popular version is the bakfiets – a carrier wagon on the front of the bicycle for hauling children, pets or groceries. Numerous bicycle shops exist to sell bikes, rent bikes, fix bikes or pimp bikes (yes, you can have a professional artist pimp your bike). Cars, buses and trams endure; but bicycles are the norm: businessmen on their way to work, university students on mobile phones, parents dropping off children, commuters racing to the train station, tourists, cycling enthusiasts in full-body spandex, or anyone else you could imagine. 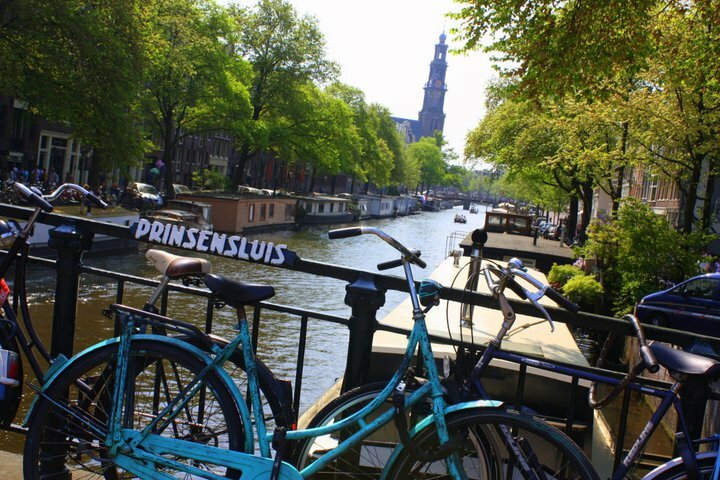 For a first-timer to this Dutch city, the use of bicycles is impressive – but watch where you walk. This societal norm towards cycling goes hand-in-hand with a through provision of infrastructure. Bicycle parking is offered throughout Amsterdam (or any Dutch city), but this is never enough. Bicycles can be seen attached to anything that won’t move – trees, canal bridges or to each other – all to prevent bicycle theft. Still, there are enough bicycles thrown in the canals, that they must be regularly dredged. Of course, the bicycle alone is sometimes simply not enough, depending on the distance one must travel. Train stations are equipped with abundant bicycle parking (sometimes floating on old barges) and/ or most trains allow bicycles; but if you don’t want to carry your bike on the train, you can easily rent one in the next city. Of course, safety is important; but not bicycle safety in the American sense (i.e. wear your helmet and embrace what may come). 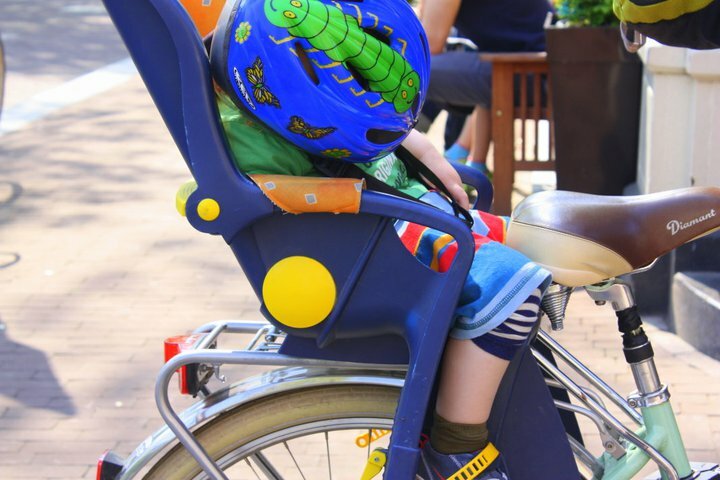 While you sometimes see helmets on children, you never see them on adults – save for the racers. Safety is reflected by well-lit and abundant cycle paths, on which bicycles do not compete with motor vehicles. Bicycle paths are everywhere – in the biggest city or smallest town – as well as an extensive cycle network connecting them. More so, cycle paths are clearly marked: sometimes with a different colour or sometimes on a raised platform. Even traffic lights have a cycle light as well as the conventional one for motor vehicles. Dutch children attend a bicycle course during primary education to really apprehend the cycling rules – or when/ where/ how to break them (safely). Likewise, drivers learn to yield to the bicycle (even learning to open the car door with their right hand to force them to swivel and see if any bicycles are approaching before opening the door). When you plan your cities around the bicycle, everything becomes a bit easier to reach. And with this proximity, comes a certain quality of life: street cafes and walkable shopping streets; schools, work, entertainment or the movie theatre are all accessible. There is rarely a need to accommodate the same level of car parking if most people arrive by bike – instead this space could be used for a city park. Of course the story is always more complicated than street cafes full of cyclists on a sunny day, or the bicycle paths that brought them there. But, it has to start somewhere. People often assume the bicycle has always reigned in the Netherlands, but this is not the case. Prior to WWII, the bicycle was king, but the post-war period brought prosperity and cheap vehicles. In a few decades, much of the Dutch cycling infrastructure was reduced. In the 1960s, activists started to demand the return of the bicycle, but it took a few generations. 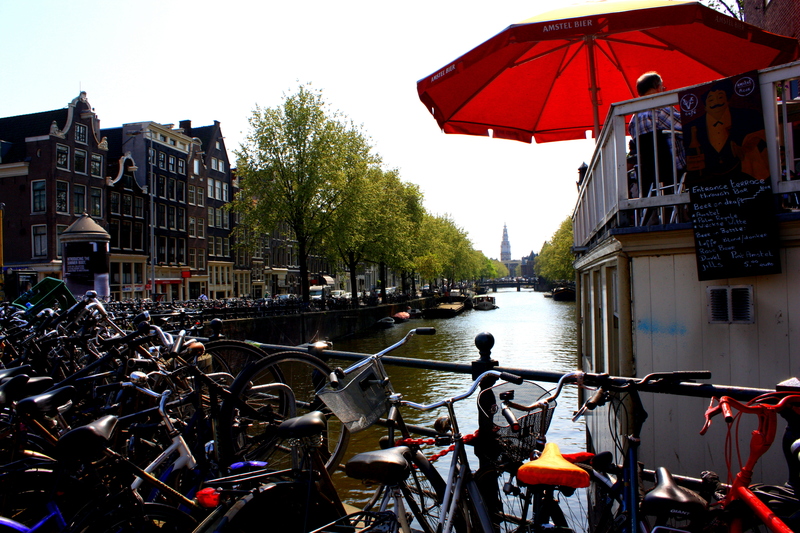 Today, one can cruise the city, marvel at canal houses, city squares or take a cycle tour outside the city. If we can learn anything from the Dutch experience, it is that it takes the right mind-set, supported by a consistent and persistent vision. In the Netherlands, there is a long history of top-down and bottom-up collaboration on this issue, during which national and local governments worked together, and cycling activists and citizens pushed for better and more abundant cycling infrastructure. These lessons however, are not uniquely Dutch, but could be applied to most cities if we had a similar vision (even in the sprawling car-centred cities of the United States). In fact, studies have found that cycling behaviour is less correlated with good weather or flat areas, but more so, with the right infrastructure provision – if you build bike lanes, they will ride.